Headlamps are a crucial part of any outdoor adventurer’s kit. Failure can be incredibly hampering, and outright dangerous at times. Black Diamond Equipment sealed the Storm headlamp against both water and dust and incorporated plenty of usable features. We’ve been testing it for six months in variety of conditions, from hurricane-induced rains, subfreezing temperatures, desert windstorms, and intense heat. The Black Diamond Equipment Storm headlamp is waterproof even during submersion and withstands impact, temperature extremes, and dust. It provides an adjustable level of light that is easily toggled to full power and has a wide array of functional features. If a fail-safe 350-lumen headlamp lamp is the requirement, the Storm is a proven contender. This 2 3/8” x 1 ½” x 1 ½” headlamp accompanied me from the dry, dusty desert environment of the Chihuahua Desert of West Texas, to the frigid sub-zero alpine of Alaska, and to Texas for the remnants of a hurricane. The Storm headlamp served bouldering, skiing, ice-climbing, and camping adventures reliably and without a hint of trouble. All lamp functions are controllable through a single top button. Once the user chooses the main lamp brightness level, the headlamp will always turn on at this setting. A tap on the right side of the headlamp body triggers maximum brightness. There are three colors available for night vision, and these colors can be scrolled through without activating the main lamp. All lamps have a strobe function, and there is also a lock function to prevent accidental discharging. The number of functions and features on the Storm headlamp are impressive, but what was the most remarkable was the lamp’s resistance to all forms of abuse. During the six months of use, no amount of freezing temperatures, smashing in packs, bumping into rock, rainstorms, dust storms or mishandling hampered any of the functions of the light. Opening the lamp’s battery door, which as a dry box type of lock and seal, proved zero water entry after hours of submersion. The Storm also shrugged off heavy sweating due trail running in the oppressive Texas summer heat. The brightest setting of the Storm headlamp proved ample for technical scrambling, and the beam pattern was pleasantly full and not heavily center-weighted like some high-powered units. 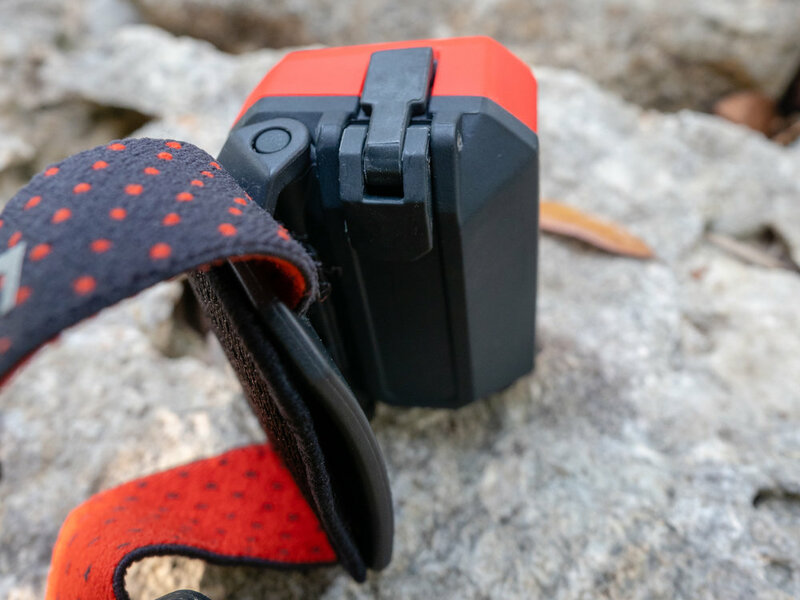 The claimed battery life of 120 hours on low and forty hours on high seemed reasonable; the Storm headlamp remained powered for an entire summer of regular use with high-quality alkaline batteries. A three-level monitor indicates remaining battery life. I have a healthy collection of headlamps. There is one in every pack, multiples in every vehicle, and there are three hanging on the hook by my back door right now. When the objective demands a fail-safe headlamp, like my Alaskan ice climbing trip this past winter, I search out the Black Diamond Equipment Storm Headlamp. It is the most robust and abuse resistant model in my collection. The Storm has a wide array of features, which are all appreciated, but what puts this lamp in my pack is the all-conditions reliability. When I need the headlamp to work, under any conceivable circumstance, the Black Diamond Equipment Storm makes the cut. Find out more at www.blackdiamondequipment.com.